In preparing our legendary gift ideas post (coming soon! 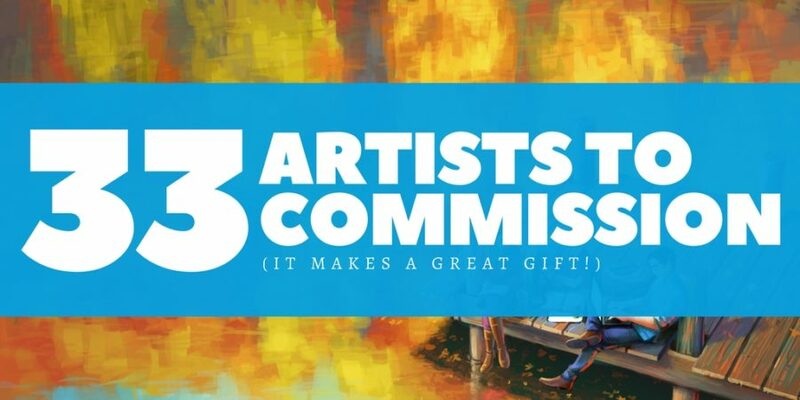 ), we also thought it’d be fun to include some great freelance artists that you can commission for yourself (or a friend) — which, by the by, makes a fabulous present. But as with our subscription boxes, we quickly got carried away. So we’re splitting this post featuring amazing artists into its own thing. Support the art community, spread the love, and get art of your characters. Pretty sweet deal. Also, all the artists marked with a (*) are offering special limited-time discounts for supporters of our fundraiser, so get in on that! Just a note: Keep in mind that the industry term “kidlit” encompasses everything from picture books to young adult. We’ve put together this list with that in mind. While they may or may not be currently open to commissions, we want to give a shout out to our lovely artists for their fabulous work with WriteOnCon 2018! We commissioned Laura for a gorgeous painting to share with our fundraising friends as a desktop wallpaper. It will also be in our swag shop as a journal. You can find Laura’s commission page here. Which of these fab creators stood out to you? Do you guys have a favorite freelance artist you like to work with? Leave a comment and tell us!